A Vision. A Plan. A Healthy Future for Rhode Island Farms and Food. Public officials and citizens alike understand the critical importance of farms and farmlands to the state’s economy, environment, public health, community character and livability. Communities support and promote agriculture. More, not less, farmland is under cultivation, meeting increased demand for Rhode Island-grown farm products. Rhode Islanders at every income level have improved access to locally grown foods. 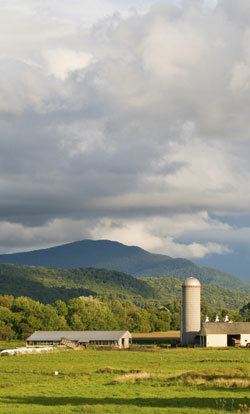 A sustainable and well-coordinated farm and food system encourages profitable farm businesses. A new plan, produced by the Rhode Island Agricultural Partnership and facilitated by our New England office, seeks to make this vision a reality. Rhode Island Governor Lincoln Chafee at Agriculture Day. Presented to Governor Lincoln Chafee and state lawmakers on May 12 at Agriculture Day, A Vision for Rhode Island Agriculture:Five Year Strategic Plan culminates a year of outreach to Rhode Island’s diverse agricultural community. More than 400 people participated in the planning process to identify opportunities and challenges for the state’s agricultural sector and to develop and prioritize goals and strategies. We were happy to partner and help facilitate this planning process. A strong advocate of planning proactively for agriculture, we are engaged in planning at all levels of government. We have provided communities with tools and techniques to sustain local farms and farmland, as we’ve done with our guide Planning for Agriculture: A Guide for Connecticut Municipalities, and will be doing with an upcoming “Farm Tools” publication in Maine in collaboration with Maine Farmland Trust and the Mainewatch Institute. We have also helped the six New England state Chief Agricultural Officers identify ways to increase production and consumption of New England-grown farm and food products through a regional Farm and Food Security Initiative. Thanks to the leadership of the Rhode Island Agricultural Partnership and the van Beuren Charitable Foundation, Rhode Islanders now have a plan that lays out how consumers, communities, lawmakers and state agencies can build a stronger and more resilient food system and agricultural economy. We are pleased to have been part of this process, and look forward to working with our Rhode Island partners and members in the months and years ahead on implementing its strategies, helping to make their vision a reality. Small farms—those with less than $5,000 in annual sales—constitute the majority of Rhode Island farms, but generate less than one percent of the state’s agricultural sales. Rhode Island leads the nation in its percent of direct-to-consumer sales. Marketing food and farm products directly to consumers is helping to improve farm profits. In the last 25 years, Rhode Island lost 22 percent of its agricultural land to development. Of the state’s remaining 40,000 acres of cropland and pasture, only 10,000 acres are permanently protected. Public and private institutions are buying more Rhode Island-grown products. Every school district in Rhode Island now serves some Rhode Island-grown foods. The volume of Rhode Island- raised food consumed in schools increased 10-fold between 2006 and 2010. Lack of processing, marketing and distribution equipment and infrastructure is limiting the ability of Rhode Island’s farms to meet the demand for their products. Farms contribute at least $100 million annually to the state’s economy—and this is a conservative estimate. Every dollar in farm product sales generates an additional dollar in economic activity statewide. Rhode Islanders spend less than one percent of their food dollars on Rhode Island-grown food. These findings point to many challenges, but also to numerous opportunities to help sustain local farms and farmland and to a healthy future for Rhode Island just as we’ve all imagined. This entry was posted in Farmland Protection, In the News, Local Farms and Food, Rhode Island and tagged Farm and Food Secuirty Initiative, Farm to School, Governor Chafee, local food, planning for agriculture, Rhode Island on May 27, 2011 by Cris Coffin.